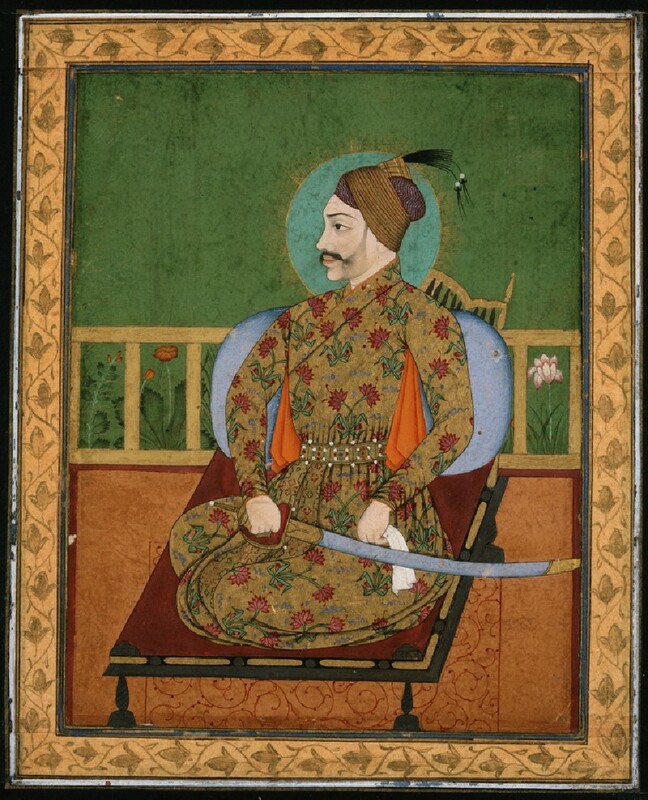 An indolent and ineffectual ruler, this youthful Sultan was compelled to accept Mughal sovereignty in 1636. In this fine portrait he is shown with a green and gold nimbus in the Mughal manner. While the imperial Mughal style was developing in the late 16th and early 17th centuries, distinctive styles of paiting had also evolved at the courts of independent Muslim Sultans of the Deccan. Although they too derived from a synthesis of Persian and Indian styles, the Deccani schools differ greatly from the Mughal in character and mood. 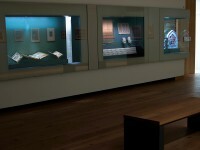 Where Mughal portraiture for example, tends to a high degree of naturalism and a soberly official view of its empire-building subjects, the Deccani artists often produced charming and evocative informal portraits of their own more hedonistic rulers, perhaps enjoying music, pleasant company or a siesta on a hot afternoon. They rendered these scenes with a refined and playful use of line and subtle richness of colour. From the 1630s however, as the Mughal emperors steadily increased their political influence over the Deccan, their more formal conventions of portraiture were adopted and to some extent reinterpreted by the southern artists. 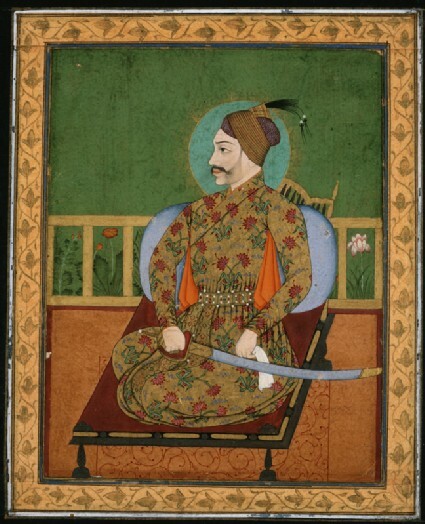 In this painting Sultan ‘Abdullah Qutb Shah of Golconda (1626-72) is shown seated in a dignified martial pose, holding the hilt of the sword in one hand and a kerchief in the other, on a low throne set on a garden terrace. The severe rectangular geometry of the composition contrasts with the brilliance of colouring of the ruler’s flowered gold jāma and purple throne-seat, the pale blue of the cushion and scabbard the pale green nimbus on a deeper green background. Above all, the sensitively modelled painting of the Sultan’s thick-lipped features conveys a dreamy and abstracted quality, hinting at the true nature of this sensual and indolent ruler, whose administration was effectively controlled by his mother.